Stretching from northwest Bergen County to northern Hunterdon County, the New Jersey Highlands is one of the state's most important natural resources, critical to the environment and economy. In March 2012, we helped protect 46 acres of woodland and wetlands known as Shale Valley in the Highlands area of Chester and Mendham Townships. The property will be owned and managed by the Schiff Natural Lands Trust, which will restore its trails and link them with existing hiking routes on the Schiff Nature Preserve and Mount Paul County Park Greenway. We have a long history of collaborative land conservation in this area. 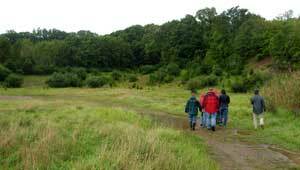 In 1998, The Trust for Public Land acquired 310 acres for the Schiff Natural Lands Trust, establishing the Nature Preserve. Ten years later, we also helped protect the 107-acre McVickers Brook Preserve—adjacent to the Schiff Preserve—which is jointly owned and managed by the land trust and Mendham Borough.